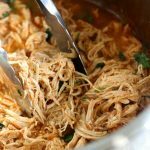 Instant Pot Salsa Lime Chicken–so you have frozen chicken breasts in the freezer and need to make dinner? 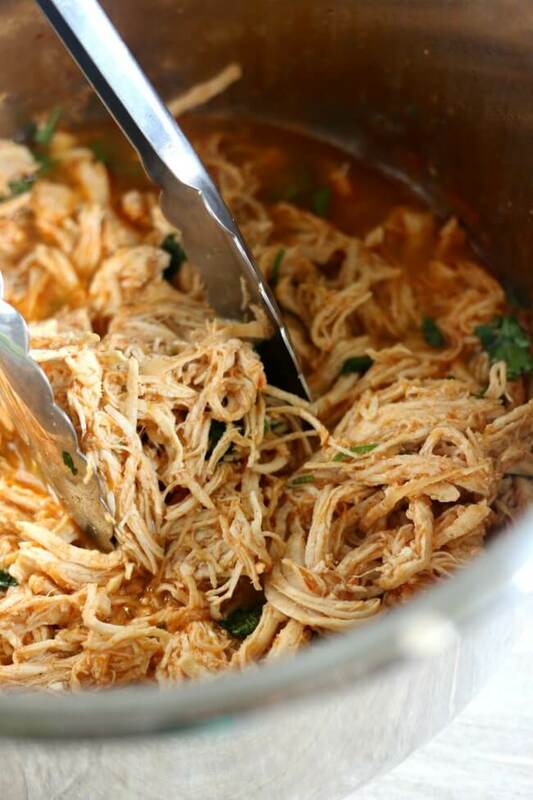 Throw them in the Instant Pot with some salsa, lime juice and some seasonings and you’ll get perfectly shreddable chicken that you can serve in burritos, enchiladas, tacos, salads or quesadillas. Dinner can’t get easier than this! I am one of those people that NEVER have thawed meats. I never remember to put the meat in the fridge the night before to thaw. That means I’m constantly using my Instant Pot and slow cooker to cook frozen meats. I love cooking frozen chicken in my Instant Pot. 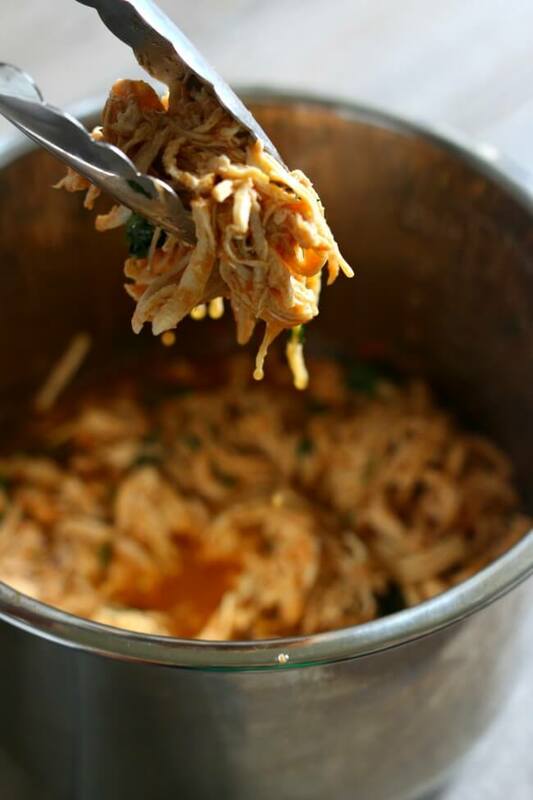 My favorite basic chicken for any recipe is my Instant Pot Seasoned Shredded Chicken. But this Instant Pot salsa lime chicken is a new favorite too. Just add 3 frozen chicken breast halves (about 2 1/4 lbs) to the Instant Pot and add in lime juice, salsa, cumin, chili powder, garlic powder and kosher salt. Set the timer to 25 minutes and then let the pressure release naturally. I have found that doing a natural release is the best way to cook meats. It allows the meats to remain tender and moist. It does require more time but I’m okay with that to get the best results. To cook this Instant Pot Salsa Lime Chicken I used my 6 quart Instant Pot Duo 60 7 in 1 for this recipe. I also own the 6 quart Instant Pot IP-LUX60 V3 Programmable Electric Pressure Cooker. They are both great pressure cookers! The first one I mentioned has a yogurt making function but other than that they are fairly similar. The price difference between the two is about $20. So you have frozen chicken breasts and need to make dinner? 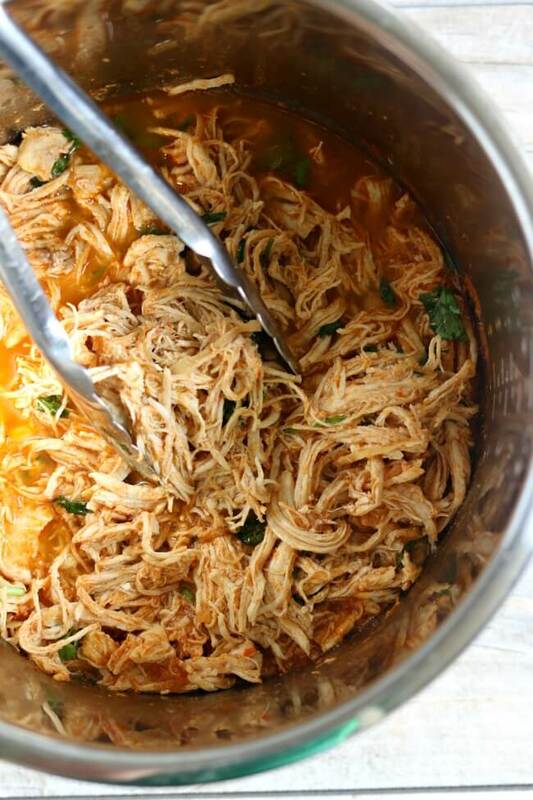 Throw them in the Instant Pot with some salsa, lime juice and some seasonings and you’ll get perfectly shreddable chicken that you can serve in burritos, enchiladas, tacos, salads or quesadillas. Dinner can’t get easier than this! Add the frozen chicken* to the bottom of the Instant Pot. Add in the lime juice, salsa, cumin, chili powder, garlic powder and kosher salt. Stir to coat the chicken. Cover in the Instant Pot, make sure the valve is on sealing, set the manual timer (high pressure) to 25 minutes. When the timer beeps let the pressure come down naturally for 15 minutes. At that point if there is still more pressure you can release it by moving the valve to venting. Remove the chicken and place it on a cutting board. Shred the chicken and place it back in the pot. Stir the chicken in with the juices. Stir in the cilantro. Use tongs to serve the chicken. You can use it in enchiladas, tacos, burritos, quesadillas, salads, etc. *If your chicken is thawed you can set the timer to 17 minutes instead of 25. You’ll still do a natural pressure release. Absolutely delicious! Used fresh garlic instead of granulated and Jack’s Special Medium Salsa. Let it release pressure naturally for about 30 min. Making this for the second time. Accidentally purchased some really hot salsa so I’m using one jar of mild and the one jar of hot and doubling the frozen chicken. We freeze all kinds of meats to add to cold salads for our lunches, husband is working out in this heat, yet needs protein to keep going all day long. This will be perfect for a taco like salad or chicken salad on a sandwich as well as all the other uses above! I’ve lost count of how many times I’ve made this now. My daughter especially loves it (particularly helpful for an EXTREMELY active girl who doesn’t normally like most protein sources). I finally got smart and started using a hand mixer to shred the chicken and it takes 10 seconds. I also use mild store-brand version of Pace since my kids aren’t into spice and leave out the cilantro. OMG this is amazing. My husband and I ate the entire batch (3qt. IP). So so delicious. I used just a dab of cilantro essential oil on the end of a fork tine. EOs are extremely potent so the tiny dab (less than a drop) was perfect here. Sent the link for this recipe to my daughter and she made for dinner but ended up eating it as soon as it was made (lunch). Thanks for sharing this great recipe. We used it in soft corn torillas (gluten free) with sour cream and hot sauce). I’m so glad you liked it Sherry. I changes sound amazing! This is a keeper!!! OMG so good. I didn’t have cilantro, so we left it off. We also didn’t shred and serve, but served the whole piece. Tender and juicy. Will be making again! So glad you liked it Elaine! Still trying to learn how to use my instant pot duo plus 60!!! Just got it for Christmas!!! I have made some great soups!! Also chicken fajitas!!!! This is a great recipe using frozen chicken breast!! Didn’t have lime juice but had fresh lemons!!! Still came out great!!! Plan on making on making enchiladas with the leftover!!! Yes you can double it and I would cook for 15 minutes with thawed chicken. Can you tell me approximately how much a serving would be? I see it makes 8 servings but trying to figure out how much a serving would be. Thanks!! Hi Sara, it’s about a quarter pound of meat per person. So if you think about a quarter pounder hamburger that will give you an idea on the density. Chicken seems to grown when it’s shredded though so it will seem like more. I used Pace Hot Picante Sauce and it was great. I think that you should comment in the recipe that no extra water is needed. I was worried the whole time it was cooking, but it came out perfect. My wife and kids loved this, another winner. Nice! I’ll make a note. Thank you so much for posting! I was worried about the water. I’m excited to try this!! Really tasty, and the kids even ate it. Win-win! Does it make the chicken dry to leave it in there that long? Mine was fine. Having said that I bet you could cut the cooking time in half. This depends on if the chicken is one frozen solid block or individually frozen chicken breasts. This was great! Thank you for sharing! So glad you liked it, Beth!! Any recommendations on what type of salsa to use? ?